The purpose of EEC is to provide post secondary education and training opportunities for youth and adults in south east Manitoba. This will assist these people in their career and personal development and will help meet the requirements for a skilled and trained workforce in order to achieve business, economic and community goals. This purpose will be achieved by providing excellent educational space for current education providers, by encouraging and assisting these education providers to respond to local training/education needs and by EEC offering the training courses when there is not another education provider prepared to do this. EEC is incorporated as a non-profit organization. EEC has also received charitable status. The Board is composed of three members from Steinbach and the surrounding area: Abe Bergen (chair), Mary Jane Hiebert (Vice-chair) and Ron Koop (Secretary-Treasurer). John Peters is part-time Executive Director. 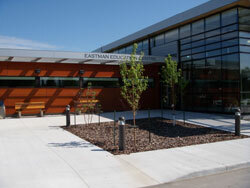 An education centre of 18,000 sq ft was completed in August 2006 on Loewen Blvd just west of the Heritage Cemetery. The centre has 11 classrooms/computer labs as well as office space. The building was occupied by the educational partners in September 1, 2006.